U-Factor measures how well a product can keep heat from escaping from the inside of a room. The lower the number, the better a product is at keeping heat in. Visible Transmittance measures how well a product is designed to effectively light your home with daylight, potentially saving you money on artificial lighting. The higher the number, the more natural light is let in. Air Leakage measures how much air will enter a room through a product. The lower the number, the fewer drafts you’ll experience. NFRC also has a condensation rating that is optional for manufacturers to include, so you may or may not see it on the label. The higher the number, the better a product resists condensation. Download the optional label. Description of the door frame or glass. Amount of glass in door by area. 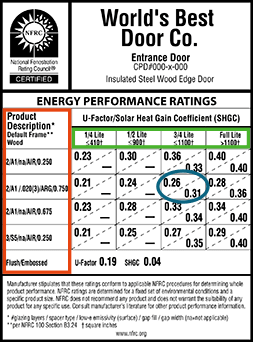 The circled value shows you the rating a door has received. 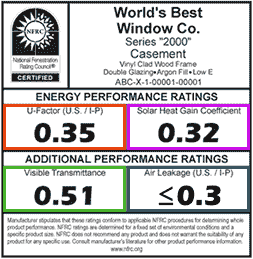 Each rating is split into two values: Solar Heat Gain, and U-Factor. Solar Heat Gain Coefficient measures how well a product can resist unwanted direct or indirect solar radiation. This radiation can cause your home to heat regardless of outside temperature, which may be favorable or unfavorable depending on whether you’re heating or cooling your home. In summer months, a low solar heat gain coefficient helps to keep your home cool. In winter months, a higher solar hear gain coefficient can help to keep your home warm. Look for: Low numbers in cooling conditions; high numbers in heating conditions. NFRC provides free fact sheets to help retailers sell more products. Download Fact Sheet here. Ready to buy? See a list of certified NFRC products. 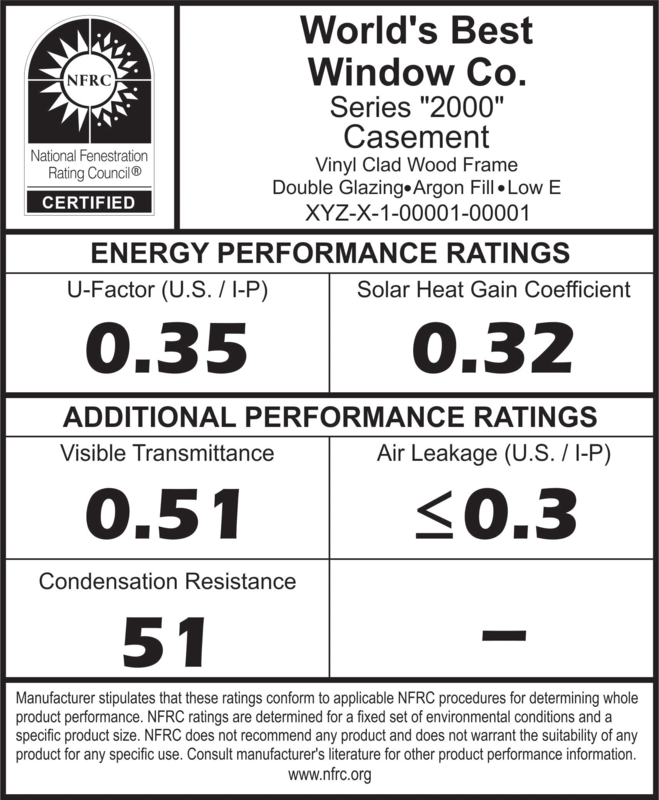 How is the NFRC label different than the ENERGY STAR label? Think of it this way: the ENERGY STAR label tells you that a product is energy-efficient. The NFRC helps you compare between energy-efficient products by giving you independent ratings in several energy performance categories.